Belgian endive is a vegetable that I use often during the winter stewed with a little beer. 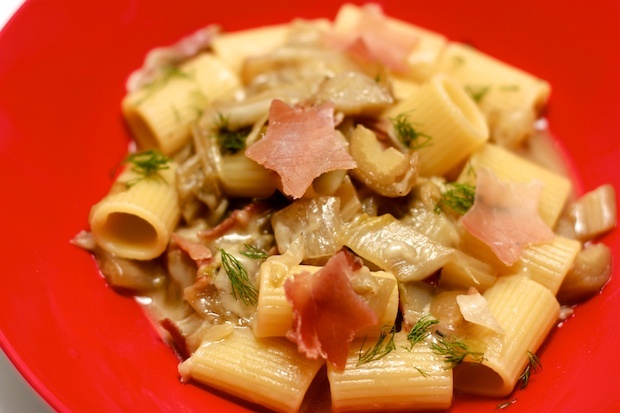 This recipe pairs it with pasta and the result is very tasty. This first course dish is a dish containing: carbohydrates, protein, calcium and vitamins. With a star-shaped cookie cutter, cut out the slices of bacon into 12 stars, with the aid of a sharp knife if the bacon starts to fray. Refrigerate the stars on a plate covered with plastic wrap. (This decorative aspect can be left out and the bacon can be cut into cubes). Cut any leftover bacon into very small pieces. Wash the endive and cut the heads in half with a knife, remove the central core. Boil a bit of salted water and when it boils, add in the endive and blanch for 3 minutes. Drain and cut into strips. Add the garlic to a pan, along with the chopped bacon, endive, and beer. Simmer for 20 minutes until the preparation becomes quite dry. Turn off the heat and add 1 1/2 tablespoons of butter. Keep warm. Grate the emmental with large holes of the grater. Cook the pasta and when cooked take 4 tablespoons of the cooking water and pour it in the sauce, drain the pasta and mix all the ingredients together. Add a final sprinkling of cheese on each plate. Arrange onto single plates, adding the stars of bacon and wild fennel to finish. Posted in Pasta, Recipes. RSS 2.0 feed.